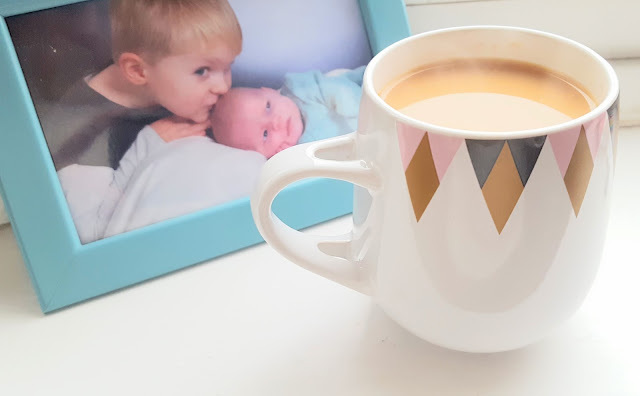 I have mentioned a couple of times on the blog how much I dislike our house, it doesn't feel like a home no matter how long we have been here. After having discussions with my parents I realised I needed to try and make the most of it for now and gradually we have been trying to put our stamp on the place. We were gifted some home wares for Christmas and our Kitchen and Bathroom have begun to look more lived in. I also rearranged our living room back in November and am feeling a lot happier with the layout so the next step were the bedrooms. Ted's new big boy room is coming along nicely and once it is finished I will be sharing it here so keep an eye out for that. For now though I wanted to show you around our bedroom! We have had so many colour schemes over the past few years from charcoal grey to beige and dusky pink and I finally settled on light grey and pastels for our new bedroom. Our walls are currently still magnolia with a latte coloured feature wall but we don't have time at the moment to paint it. Ideally I would go for a completely white room which I can just add accent colours to but that will come soon so for now just ignore the walls! The reason this is a budget makeover it mainly due to the walls not being painted and us still having God awful carpets but as it is a rental house we can't change that. Ok who is ready for the tour? Our bedroom is a funny shape, it has this main bit and then a little alcove next to the airing cupboard. I have set up my desk in the alcove alongside our wardrobe. As you can see it is quite small but we have done the best we can with the space. The radiator colour wasn't our doing..as I am sure you can imagine there are not many people in the world who would paint a radiator that hideous colour but we can't change that one either. The grey curtains are from Ikea, they used to be in our kitchen/diner but I liked the colour. They help to cover up the gross office style blinds (thanks Landlord!) and are actually tied back with grey and white striped ribbons. Our chest of drawers was actually mine when I was little and is solid pine. I love pine furniture, I know it isn't 'in' at the moment but that doesn't deter me! The bed is also pine and was picked up for £90 from a local recycling center. It is really chunky and as with the chest of drawers I know it will stand the test of time. The bedside table on Joe's side is one of two but we could only fit one in. I don't like it but it was given to us when we moved in together and we are yet to replace it. Moving closer in, this is our bargain bedding from Ikea. I think this set is about £5 or something ridiculous and since buying it I have seen it on numerous TV shows! It isn't perfect and we actually picked up another set which is pictured below which I think works better with the room. 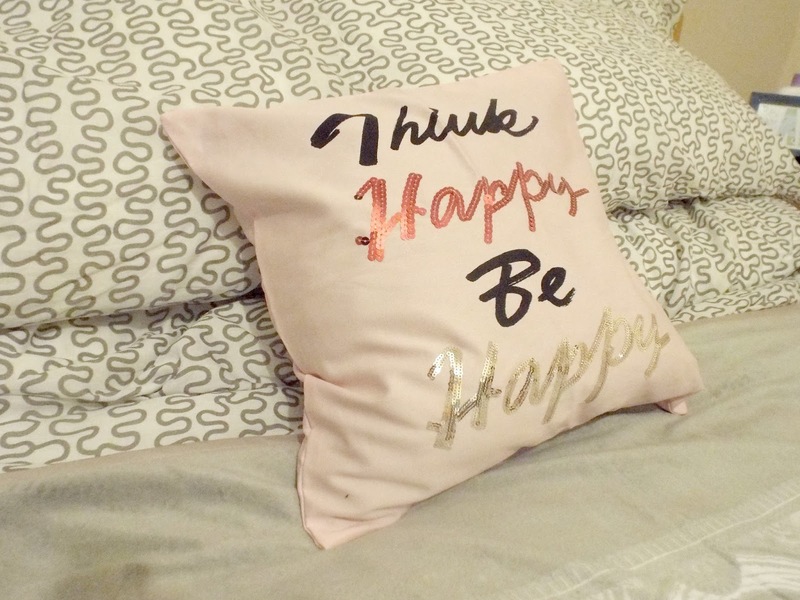 I adore this cushion from H&M which was £3 in the sale. A good inspirational quote goes a long way and the pink ties the pastels in nicely. 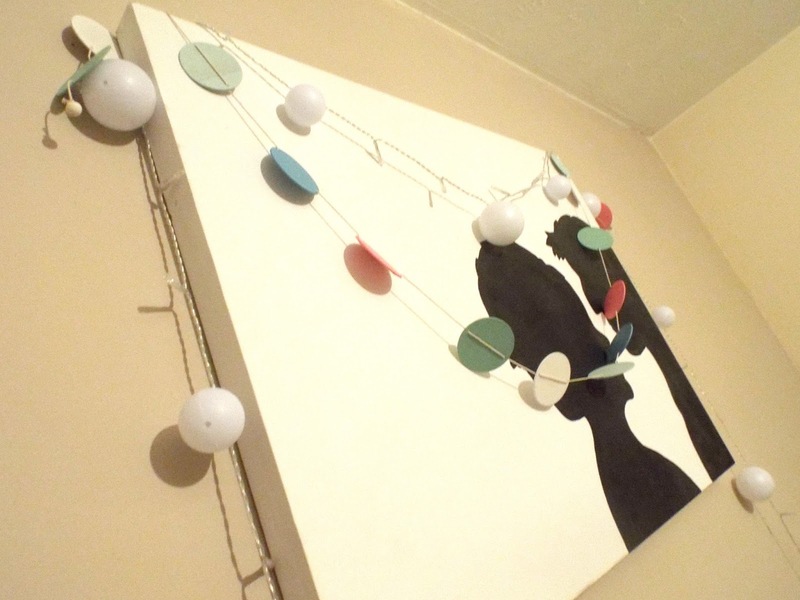 The painting on the wall is a silhouette I painted of us a few years back. It is far from perfect but I painted it and I couldn't think of a better place to display it! The lights and garland are both featured in my January Sales Haul with the bedding above. It is so nice to have fairy lights in a bedroom at night time, although being cheap lights these aren't quite bright enough so I need to get some more. I do recommend battery powered lights though as they are safer for night time. After taking this shot I decided to move the fairy lights to around the headboard and added my gorgeous new Really Really Designs garland. Sausage, Chips and Sandy Feet is a phrase that evokes so many memories of the night Joe proposed to me. Very few people in our lives understand the reference but it is perfect. Read the proposal story if you haven't already and you will 'get it' too! The garland was made by the very lovely Hayley from Really Really. 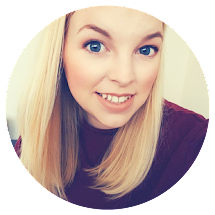 She actually lives about 20 minutes from me and her Etsy shop is full of the quirkiest gifts an homewares. I have always wanted one of these letter garlands and am so grateful she made us one for our new room. 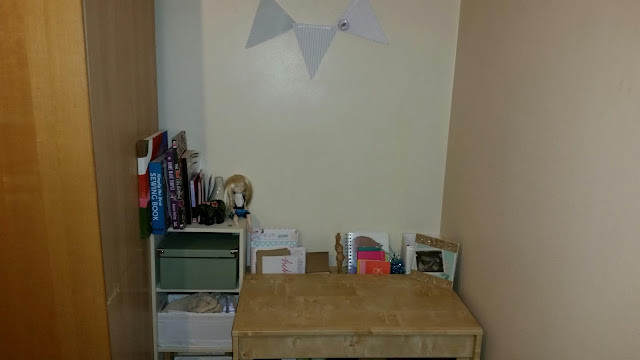 This is my area of the room, my little blogging nook! I have had this desk for years, another Ikea bargain along with the bookcase which actually lived in our bathroom before I stole it and moved it in here. I added some paper bunting I had from my Paperthemes wedding samples and all of my favourite ornaments are there including my £3 bargain handpainted bear from TKMaxx. 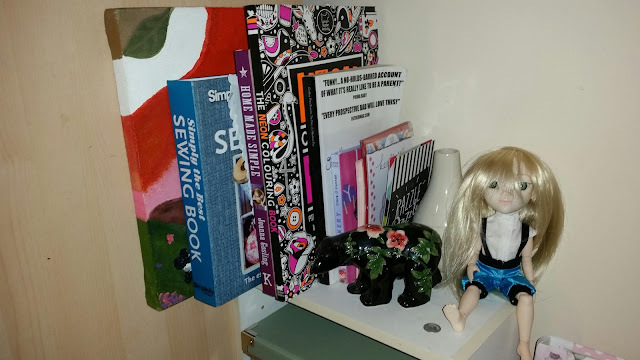 I have embraced my blog/crafting space and used the shelf to store all of my favourite books. Laterella my Makie doll has a home here too, she may creep some people out but I am still in awe of 3D printing and am fascinated by how she was made. 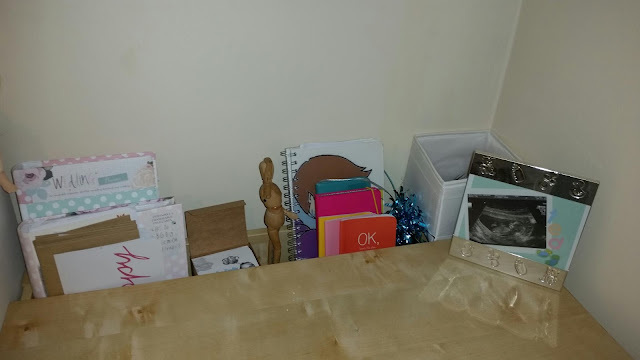 My wedding planner, notepads, diaries and business cards are finally all in one place ready for when I need them and of course Ted's baby scan picture and sparkly weight from his 2nd Birthday party balloons are in pride of place! 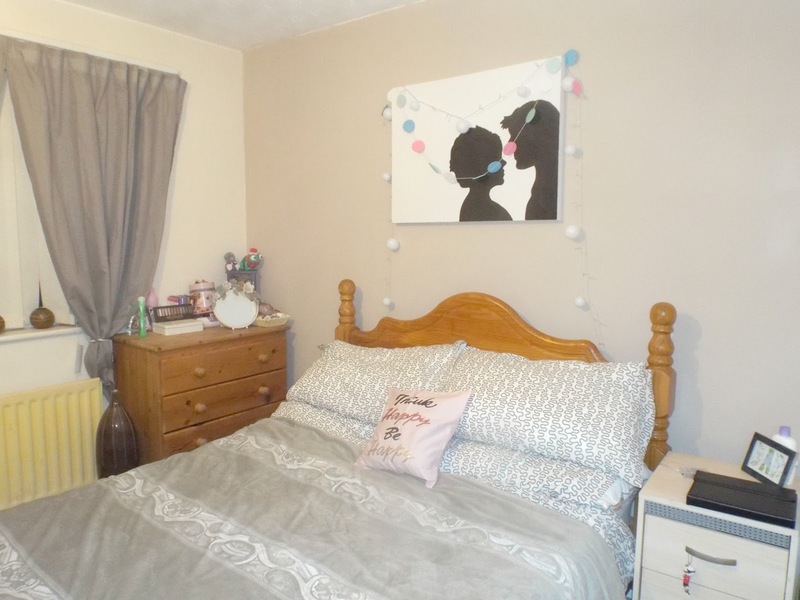 I never had my own room for long growing up, being the eldest of 4 I always ended up sharing my space so having my own chill out zone really means a lot to me and I am so relieved to have finally got rid of some of the household clutter to have a relaxation space. 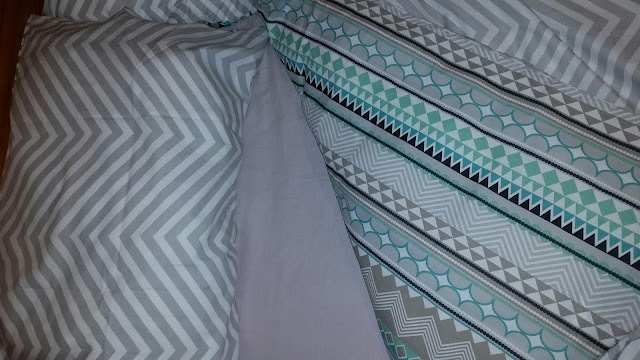 Before I forget...this is our new bedding. We picked it up yesterday from Aldi for £9.99. It is double sided and I think it works fantastically with our colour scheme. I have so many idea's for adding to the bedroom and my Pinterest board is overflowing with pastel loveliness so hopefully there will be more additions to come!